At the beginning of the year, I figured I would start some kind of "school" schedule or maybe a unit study habit, and that never really took off. I do agree with most who say that the only thing that's important at this age is a) books, and b) play. So for the first quarter of 2019, it's just been dance class, swim class, and a lot of trips to the Science Center and MOBOT to play with kids. I also cut way back on tablet/screen time because as long as that isn't an option, her imaginative play will occupy her all day long. In the past couple weeks we've started to fall into more of a pattern, and while I'm still trying to avoid being Nathan (Rick Moranis) from the movie Parenthood, this kid is UNSTOPPABLE when it comes to books. At the end of a day of "benign neglect", I'm usually surrounded by books on the couch. She has memorized most of the Elephant & Piggie books that we own, and is working on the UBAM phonics box set. She "reads" those books every day. She has also started asking a LOT more questions and showing interest in particular topics (she even sat through Disney College of Knowledge assessment with me today and says she wants to be a VIP tour guide when she "gets big".) And we are working on numbers 11-100. Uncle! I guess she is ready for Pre-K. So this week I am semi-reluctantly dipping my toe into a unit study. We're following along with the Kid Kit/Naturally Crated Bee Inspired challenge, which has a bingo board and weekly activities. I figure that with out regular classes and activities outside of the house, for the time being Tuesday & Friday will be at home school days. Dad is in charge of collecting up the books for our unit studies, because her book obsession is definitely a result of his consistent bedtime story routine. Here's the beginnings of our Bee Inspired challenge! 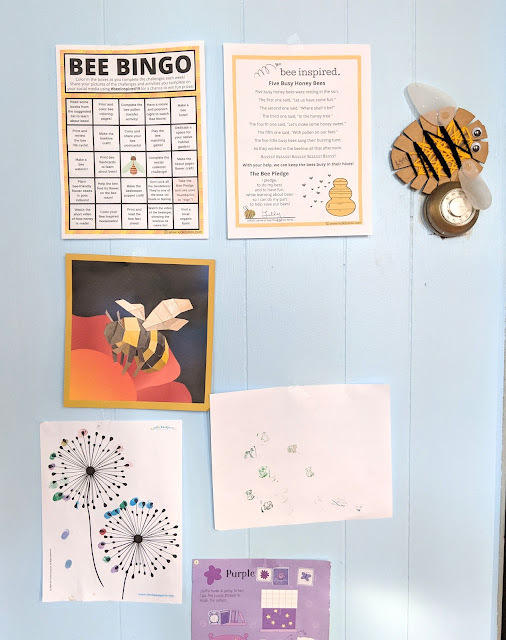 Our Bee Bingo board, the Bee Pledge, a bee we made at Little Sprouts class last year, a bee Paint By Sticker, and by total coincidence, a dandelion printable I had ready for today. We learned that dandelions are the bee's first food in the springtime, so leave them be(e)!